Every so often, the idea of giving players an additional spec gets brought up by one person or another. It’s not unprecedented — Druids have a fourth spec, after all — and there’s probably enough fantasy within each class that it’s not hard to imagine what an additional spec would look like were Blizzard to implement them. Now, it’s not something I ever see actually happening, mind you — even ignoring the fact that Demon Hunters premiered with only two specs, the balancing nightmare that designing a new spec for each class would be is not something I can see Blizzard ever wanting to add to their workload. All the same, that doesn’t stop players asking if it’ll ever be a possibility, and it certainly doesn’t stop us from having fun imagining what a new spec would look like. 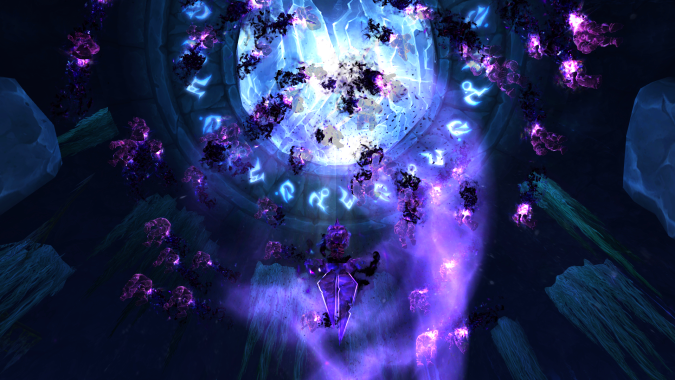 For my part, it’s pretty easy to imagine Priests getting another Shadow-based spec that emphasizes DOTs and the Void less, instead focusing on more of the “Shadow Mage” playstyle we (sort of) had during Warlords of Draenor. Although far less emphasized since our class-fantasy overhaul in Legion, Shadowfrost is still technically a spell school in the game. Were Blizzard to implement a new spec for Priests, I could totally see it being something that used Shadowfrost spells, hit harder with each spell, relied more on cooldowns, and didn’t utilize the same stats as current Shadow does. Of course, doing so would potentially mean doubling down on the Void/DOT aspects of Shadow — but is that really a bad thing? Shadow is a unique enough spec that splitting it into two playstyles could easily work. Again, this was more or less done in Warlords of Draenor with our final talent tier. The issue there wasn’t the playstyles themselves, but rather having several talent tiers preceding that one which didn’t necessarily meld with those “sub-specs” evenly. Given completely separate talent trees, I think each sub-spec would have worked much better. But that’s just my vision for a fourth Priest spec. If you could add another spec to your favorite class, what would it look like? Would you bring back Gladiator as its very own spec? Would you design something completely new? Go wild with your imaginations, readers!